Persja i Przyjaciele. Sztuka dla domu. "Turquoise and marble cupolas, arches adorned with flowers and arabesques, motionless basins reflecting slender minarets, sparkling enamels of floral bouquets, miniatures populated by lovers stretched out in the shade—all these form part of the luxury decoration, refinement, and high spirituality that we define as "Persian style." H.Stierlin, Islamic Art and Architecture: From Isfahan to the Taj Mahal, 2002. 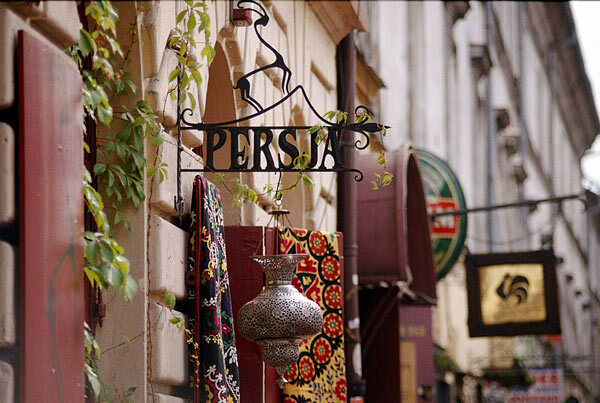 Galeria Persia operating in the Kazimierz district of Kraków since 2002, desires to show at least a little particle of widely-understood iranian culture, offering products of the nomadic weavers, craftsmen, miniaturists and other artisans not only from various regions of Iran, but also Afghanistan, Tajikistan, Turkmenistan and Uzbekistan. Those products are antique and contemporary flying carpets, rugs, kilims, embroideries and decorative textiles, ethnic clothing and jewellery, fine lamps, ceramics and other original artisanship. Three honestly devoted hotheads – persian filologists, personaly choose the objects oat the bazars and markets of Tehran, Isfahan, Mashad or Shiraz. Frequent trips to Iran, speaking farsi and knowledge of persian art makes our offer full of exquisite and splendid articles. Textiles from gallery’s collection have been placed in many polish and foreign films (eg. „Edina“, „33 scenes from life“, „Csoda Krakkoban“), as well, as in polish interior and décor magazines (eg. „Elle Decoration“, „Weranda“, „Dom z Pomysłem“) . Galeria Persja also makes efforts to popularize knowledge about Iran. We organize and co-organize various cultural events like concerts, festivals, exhibitions of contemporary iranian art. We support charity organizations and events organizing auctions for Afghan refugees in Iran. We played active role in supporting the vicitims of the Bam earthquake.